Dudley’s story has already touched many people. We can only guess that this boy had a home until he became disabled, and that after years of devotion he was no longer wanted. 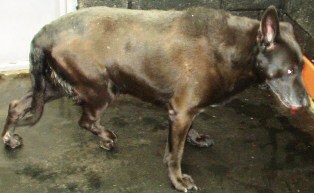 When Dudley arrived at the pound many people understandably felt that he should be put to sleep. 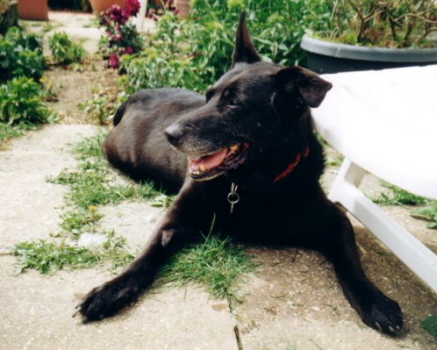 He was an elderly, overweight crossbreed (maybe Lab X GSD), with weak back legs and obvious incontinence problems. His rear legs intermittently gave out on him, and he would sit in his own urine. 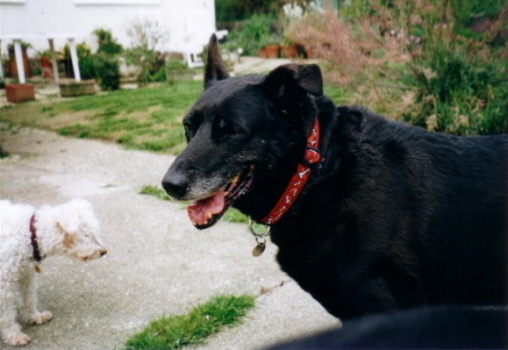 However, Dudley seemed alert and friendly, and not distressed by his condition. Discussions were held between Rochdale Dog Rescue and the pound about the best outcome for Dudley, and as the option to put to sleep is never taken lightly, it was agreed that RDR would arrange a trip to a vet for a medical opinion. Arrangements for the transport were made, and Bernie and Coryn took Dudley to the vet. With the weakness in his hind legs he could get out of a car with minimal assistance, but needed lifting in. On arrival at the vet Dudley jumped out of the car safely, and spotted another couple of dogs. His tail wagged and he seemed to want to meet them. In the reception area Dudley met a young male Rottie and a female Yorkie and was excited and eager to play. He showed no sign of pain or aggression, and his eyes lit up at their company. 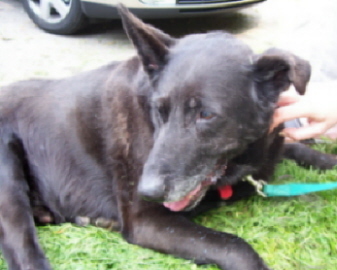 The vet gave a very thorough examination and Dudley was diagnosed with CDRM, a condition affecting mainly German Shepherds and resulting in paralysis of the hind quarters. 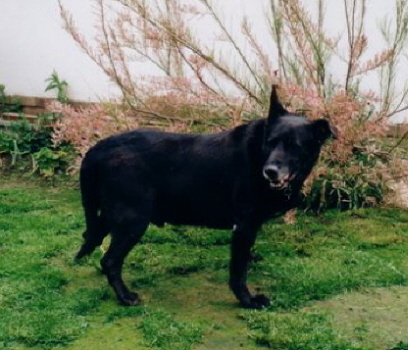 The vet felt however that Dudley was a happy dog, unaware of his condition and suffering no pain. 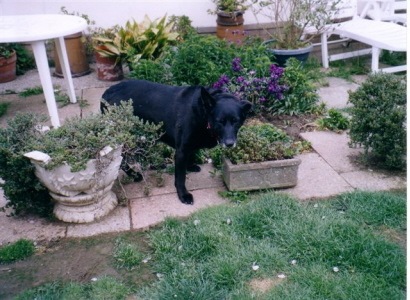 He would be classed as a 'disabled' dog, not a sick one, and there was no immediate reason to euthanise. He felt that Dudley had no other health concerns and is unlikely to need major medical involvement. Furnished with the information from the vet, the decision was made that as no-one had been to claim Dudley we would seek an appropriate rescue space. However, time was of the esence as he had already come to the end of his 7 days and a very special rescue space was clearly needed. It was a tall order as Dudley was not likely to be rehomable. Feelers were put out and the grapevine worked its magic. ‘Tailends’ was suggested. Tailends aim to offer a lifetime retirement home for dogs that are terminally ill, frail or elderly. After telephone enquiries it was clear that Dudley would be welcomed with love, care and any necessary future veterinary attention provided. The arrangement of transport was a mammoth one. A trip of several hundred miles, in an area Rochdale Dog Rescue does not have a plethora of volunteers! We managed to get Dudley sorted as far as Gloucester, but there his travel arrangements died. Natalie stepped in again, and the Labrador Forums were called to arms. More new volunteers stepped forward and it all fell into place. Dudley would be moved on Friday 12th May, from the North West, to the South West. A long 8 and a half hour trip saw Dudley helped by Bernie, Kazz, Becs and Rhoni. They all said what a true gentleman he was and how he stole a little of everyone’s hearts. There was no sign of incontinence on route, and he didn’t even sleep. He had a break from the car at each hand over, and a chance to stretch his legs, but never once complained about being hoisted back in for another stretch of mileage. 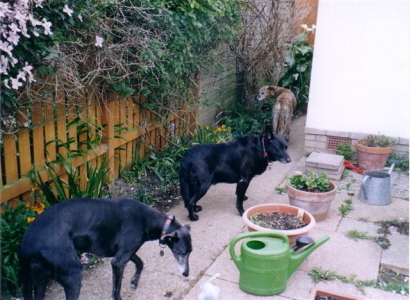 On arrival at Tailends Dudley was introduced slowly to the other residents, mainly elderly and infirm greyhounds, with a few smaller dogs thrown in for good measure. Dudley behaved impeccably, and despite some caution on the part of a couple of the existing residents Dudley showed no concern about them at all, and soon settled down on a bed for a well earned rest. The next morning Dudley went for a walk with a spinally damaged greyhound. Angela at Tailends was surprised as Dudley walked further than everyone had presumed he could. He was enthusiastic, alert and fascinated by the rabbits he saw, and the scents of foxes and badgers. Angela said “his tail wagged the whole time and he was grinning”. Dudley would have walked on further, but Angela felt he’d gone far enough for his first day. She is going to put him on a weight loss diet to ease the pressure on his back legs, and has already introduced Glucosamine and Chondroitin along with fish oil and other therapies to help his coat and joints. Angela stated that Dudley is loving, friendly and happy boy who has been fantastic with the other dogs and is already 'at home'. His only flaw? He’d eat her out of house and home given an opportunity! 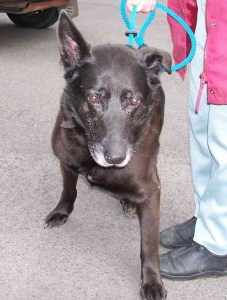 "I received a telephone call on Wednesday 10th May from Rochdale Dog Rescue concerning an elderly dog at the pound who was due to be put to sleep. Apparently the dog had been picked up by the police who took him to the vet as they thought he had been involved in a road accident. In fact Dudley has CDRM which is a degenerative disease affecting mobility in the back and hind limbs. The vet kept him for 5 days...and then sent him to the pound where he was only due to live for a further two days to complete the statutory seven days. Of course I agreed to take Dudley as I could just about fit him in – though at the time did not realise what a big chap he is. The only proviso was that he must be able to live happily alongside the other residents here. I was assured that Dudley was a friendly chap and had shown no aggression towards other dogs, large or small. I felt that I was meant to help Dudley as the call for help came just hours after my dear little Sugarlump had died in my arms following a massive heart attack. Thursday 11th May was very stressful for members of Rochdale Dog Rescue as they had to somehow arrange for Dudley to be moved from the Dog Pound...and transport him 300 miles to North Devon. This was all done through various websites. Five wonderful people agreed to give up their time and petrol to help Dudley. He finally arrived here at Tailends at around 5pm on Friday 12th May. He was very tired and a bit bewildered but showed no sign of aggresssion towards the other dogs as he was gradually introduced to them all. 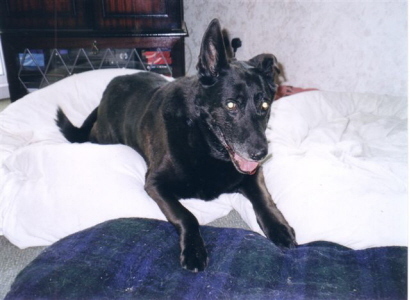 Then he was brought indoors to have a good rest on a nice “Memory” bed and a meal. He was very hungry and made light work of his meal. I realised that he would have to be put on a strict diet if we were going to have any chance of helping him become more mobile. He is now on Royal Canin Obesity Control dry food mixed with a little of the canned variety to make it a bit more palatable for him. He does have a little scambled egg mixed in with his breakfst and a little fresh chicken with his dinner. The food is weighed carefully to ensure that he does not eat too much. Dudley is so very happy to be here. I have no idea what his previous life was like but I doubt he was cared for very much. No doubt he roamed the streets begging chips or snack foods where he could. Poor old chap. He deserved better than that. Dudley went off to the vet the following week for a check and blood test. We decided to have his damaged dew claws removed and also to get him castrated. We are so glad we did as when the hair was shaved off it revealed a large area of microbiological skin infection around the scrotum. He has now been treated with antibiotics to clear up this problem which he had probably had for some time. The blood test revealed some kidney failure though this is not too serious at present. Dudley has CDRM and also arthritis in his hips. He is now on Previcox tablets in addition to fish oil, vitamins and glucosamine and chondroitin. I have purchased a rear harness to assist him if he gets into difficulties and also a pair of boots for his rear feet to prevent damage to the back of his feet. He does manage very well and has probably had to do the best he can for some time with no help. Dudley goes out for two walks every day – usually with Tarn, a lurcher who came here at the end of January from the northeast and has serious spinal problems. He loves to go out of the back gate and head off at speed down the footpath in pursuit of the rabbits which sit around in the sunshine. His tail wags so much it looks as if it will come off. I have never seen a dog’s eyes light up so much as when he goes out for a walk. He has a big grin all over his face. Dudley sleeps on a large thick duvet in the hall at night. He can see me as we never shut the doors and he often looks up to make sure I am still there. When I get up in the night to attend to any of the other dogs, he always looks up and enjoys a pat as I go past. During the day he sleeps in a variety of places. Recently he likes to get up onto the sofa (with a little help) and lie up there looking around at everyone. He is so affectionate and loves attention. He manages to get in and out of the door and potter around the garden with the other dogs. He drinks a lot so I always make sure he has a bowl of water hearby. This is obviously related to the kidney problem. I have no idea how old Dudley is or what the future holds for him but we adore him and will do our very best to make sure that the rest of his life is as stimulating and enjoyable as possible. We hope he will be here for years to come. Dudley has already been sponsored by four people and he has touched the hearts of everyone who has met him. We will put updates on his progress and his latest photographs on the Tailends website." Thank you Angela for everything you are doing for Dudley. 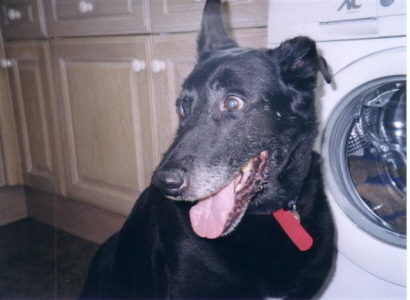 Angela at Tailends has given us the sad news that Dudley was put to sleep on Monday 2nd April 2007. Angela had noted a deterioration in his condition in the last week, and when it became clear that Dudley was no longer enjoying his life and was in distress, it was agreed with veterinary advice that the time had come. Dudley left surrounded by love and with immense dignity. We cannot thank Angela enough for the wonderfully happy and healthy 11 months Dudley had with her, the incredible love and care shown to him, and the dedication Angela shows to all her "poorly" dogs. Tailends is an amazing rescue, run by an amazing lady. Thank you Angela from all at Rochdale Dog Rescue.